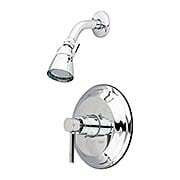 We have a complete selection of finely constructed and stylish shower faucets. 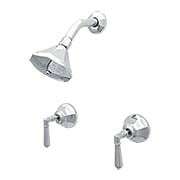 Whether you need to replace a bathtub shower faucet or shower stall faucet, we have faucets in a wide variety of styles and finishes. Comes with all the parts you need for quick and easy installation. 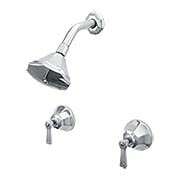 The Potomac collection offers classic style and long-lasting performance. 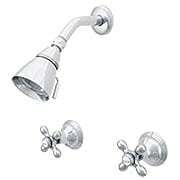 Constructed of solid brass, this durable shower faucet comes in your choice of four premium tarnish and corrosion-resistant finishes. 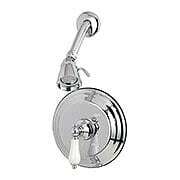 With a traditional silhouette and stylish lever, it makes a charming addition to a variety of bathroom interiors. The Potomac collection offers classic style and long-lasting performance. 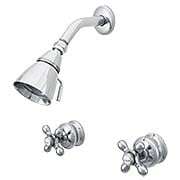 Constructed of solid brass, this durable shower faucet comes in your choice of four premium tarnish and corrosion-resistant finishes. With a traditional silhouette and stylish cross handle, it makes a charming addition to a variety of bathroom interiors. The Biscayne collection is a dynamic blend of Art Deco and Mid-Century design influences. 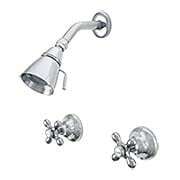 Constructed of high-quality, cast brass, this shower faucet comes in a polished chrome, tarnish and corrosion-resistant finish. With its clean lines, stepped square backplate, and cylindrical lever, its an exciting addition to any modern bath. The Biscayne collection is a dynamic blend of Art Deco and Mid-Century design influences. 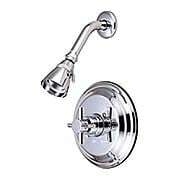 Constructed of high-quality, cast brass, this shower faucet comes in a polished chrome, tarnish and corrosion-resistant finish. 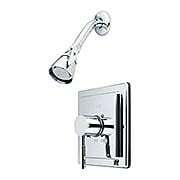 With its clean lines, stepped square backplate, and Bauhaus lever, its an exciting addition to any modern bath. Low profile curves and vintage accents make the Burbank collection an elegant addition to any bath. 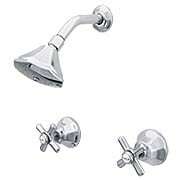 Constructed of solid brass, this shower faucet comes in your choice of five tarnish and corrosion-resistant finishes, and features a drip-free ceramic cartridge system. Traditional white porcelain levers add the finishing touch. With its harmonious mix of old-world style and early-American accents, the Columbia shower faucet brings a distinctive look to your bath. Constructed of solid brass, it comes in your choice of two tarnish and corrosion-resistant finishes, and features a drip-free ceramic cartridge system. 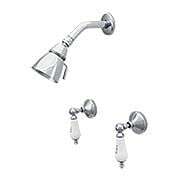 Traditional white porcelain levers and escutcheons add the finishing touch. 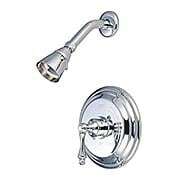 The St. Andrews shower faucet is an elegant addition to complete the look of your vintage bathroom. Made of solid brass, this sturdy ensemble comes in your choice of five tarnish and corrosion-resistant finishes, and is equipped with a drip-free ceramic cartridge system. With premium materials and classic American cross handles, this treasure offers a lifetime of beauty and performance. The Mississippi Wall-Mount Shower Faucet with Hexagonal Cross Handles evokes 1930's glamour with bold, refined lines and classic accents. Designed to last a lifetime, this sturdy ensemble is finely crafted from solid brass. It features a drip-free ceramic disc cartridge system and comes in an array of tarnish and corrosion-resist finishes. With its geometric silhouette and hexagonal cross handles, it is at home in a variety of decors. 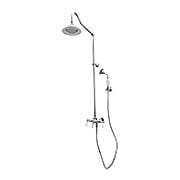 The Mississippi Wall-Mount Shower Faucet with Hexagonal Levers evokes 1930's glamour with bold, refined lines and classic accents. Designed to last a lifetime, this sturdy ensemble is finely crafted from solid brass. 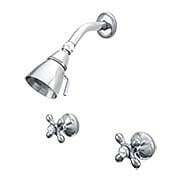 It features a drip-free ceramic disc cartridge system and comes in an array of tarnish and corrosion-resistant finishes. With a geometric silhouette and levers, it is at home in a variety of decors. Low profile curves and vintage accents make the Burbank Collection an elegant addition to any bath. 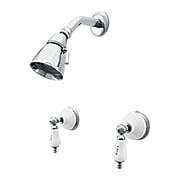 Constructed of solid brass, this shower faucet comes in an array of tarnish and corrosion-resistant finishes, and features a drip-free ceramic cartridge system. Traditional cross handles add the finishing touch. 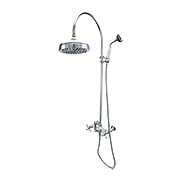 The Mississippi Wall-Mount Shower Faucet with Flat Levers evokes 1930's glamour with bold, refined lines and classic accents. Designed to last a lifetime, this sturdy ensemble is finely crafted from solid brass. 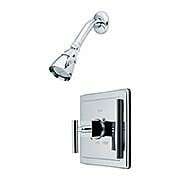 It features a drip-free ceramic disc cartridge system and comes in an array of tarnish and corrosion-resist finishes. With its geometric silhouette and flat levers, it is at home in a variety of decors. Adopted from early 20th-century style, this shower faucet combines a sleek silhouette and premium materials for a traditional look and long-lasting wear. Constructed of solid brass, it boasts an array of tarnish and corrosion-resistant finishes and a drip-free ceramic cartridge system. 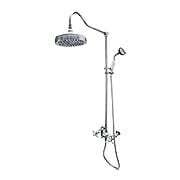 An arched spout and stylish cross handles complete this fashionable ensemble. The graceful curves and Victorian-inspired details of the Deschutes collection bring elegant style and long-lasting performance. 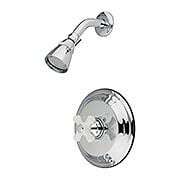 Constructed of solid brass, this shower faucet comes in an array of tarnish and corrosion-resistant finishes and features a drip-free ceramic cartridge system. Stylish cross handles complete the ensemble. The graceful curves and Victorian-inspired details of the Deschutes collection bring elegant style and long-lasting performance. Constructed of solid brass, this shower faucet comes in an array of tarnish and corrosion-resistant finishes and features a drip-free ceramic cartridge system. Stylish porcelain accents complete the ensemble.